EAUC are a not-for-profit, member based charity, run by members for members. From starting out as a voluntary organisation in 1996, we have grown to represent over 2 million students and nearly 400,000 staff with a spending budget of over £25 billion. We help leaders, academics and other professionals to drive sustainability to the heart of their post-16 education institutions. We are a well-established and credible organisation. We serve and connect our members – enabling their creativity and dynamism to lead the sustainability agenda. We believe now is the time to act so that our collective voice continues to be heard and have impact. We see a huge opportunity to maximise our networks, expertise and knowledge and put post-16 education at the centre of solving the world’s issues - making sustainability the new norm. Our powerful strategy sets out how we can better support our members to inspire, challenge and enable students, staff and sector leaders. 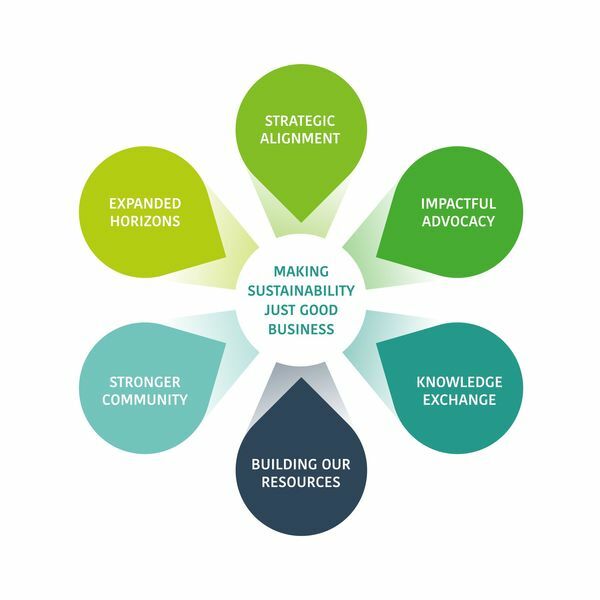 Together, we will position sustainability at the heart of each institution’s core strategy. This strategy is our opportunity to move from good to great. We will demonstrate the importance of the post-16 education sector in moving towards a more sustainable society, and to have relevance and impact on a global scale. To keep our focus on long-term action, we have set our vision and purpose to 2030. However, our strategic goals will structure a rolling 5-year strategy (2017-2021), with an annual review. This will enable us to respond to emerging issues and continuous change in the sector. Read our full strategy here. Since we first started a lot has changed. Internationally, we have seen growing environmental and human emergencies. Alongside these, the launch of the new Sustainable Development Goals - with Goal 4 emphasising the importance of education and learning opportunities for all – act as one of our external drivers. In the UK and Ireland, the environmental movement within post-16 education has grown to embrace all aspects of sustainability. Students are more empowered and the sector has more autonomy to lead itself whilst society expects responsibility and public benefit. Experiencing these fast moving changes means that the sector is somewhat destabilised. While it is certainly a period of change, we are also clear that disruption drives innovation and we recognise new opportunities ahead. Combine dynamic and interconnected students with the knowledge, expertise and passion of institutions’ staff members, along with increasing international collaboration – you have the recipe for not just change, but for transformation. The issues of social, environmental and economic sustainability are interlinked, so our approach to solving them must be too. Furthermore, education and research have a fundamental and unique role in creating a world with sustainability at its core. For this reason, we are focused on using our considerable convening power to drive innovative developments in the sustainability sector through post-16 education institutions. In order to facilitate, accelerate and help lead this movement, we will work at both an operational, academic and a strategic leadership level with these organisations and wider society. In recognition of this approach for EAUC as a catalyst for change.